Calendula�s vivid orange or yellow flowers provide not only a splash of color to the garden, but add zest to salads and similar dishes as well. 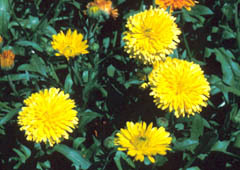 Calendula is exceptionally tolerant of cold weather in fall, and has long been grown as a pot herb for its edible flowers. This plant prefers cool weather and performs best in early summer and late fall. edible landscaping - Often grown as a kitchen herb, calendula's spicy leaves and flowers serve as flavorings for soups, salads and garnishes. The flowers can also be used as a yellow pigment in place of saffron. Dry flowers or leaves for longer storage. Propagate by seed - Sow seeds outdoors a few weeks before the last frost in the spring, or start them indoors 6 to 8 weeks before the last frost. Avoid warm propagation temperatures, as they will produce weak plants. Keep the seeds covered with soil, as light inhibits germination. Start an additional set of seedlings in the summer for optimal fall flowering. Deadhead spent flowers and pinch back to keep bushy. If flowering performance dwindles in mid-summer, cut the plants back severely. Flower production will be particularly increased by fertilizers high in phosphorus. Petals of single flowered varieties have better flavor. �Art Shades� Mix: flowers are bright variations of yellow and orange, in single colors or as bicolors. Showy dark brown centers provide an interesting contrast. Tolerates poor sites well. 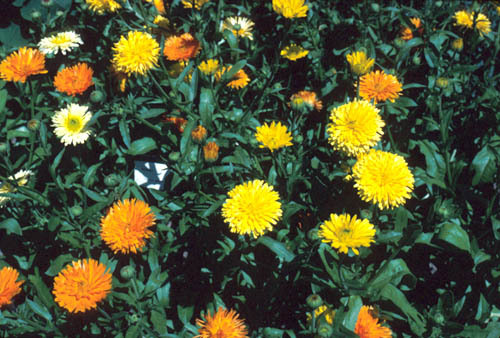 �Bonbon� Series: very dense, pompom like flowers in shades of yellow and orange on dense, compact plants. Flowers earlier in the season than most Calendulas. Good for container growth. �Touch of Red� Mix: flowers in shades of yellow and orange with red tipped petals. �Calypso� Series: compact, dense plants are good for container growing. Flowers are double, and come in shades of orange and yellow. The flowers have dark colored centers. �Pacific Beauty� Series: heat tolerant plants bear flowers in shades of yellow and orange on long, strong stems. �Prince� Series: the best for cut flowers. Shades of yellow and orange flowers on long, strong stems. Heat resistant. Prolific flowers. �Kablouna� Series: mildew resistant plants with flowers in shades of orange and yellow. Petals are arranged around tufted and pronouced centers. �Greenheart Orange�: orange petals are arranged around a large, lime green tufted center. Very different from typical Calendula flowers. Showy plants are 1 � to 2� tall. �Radio Extra Selected�: very unusual cactus-like blooms are orange, with quilled petals. The plants grow from 1 � to nearly 2� tall.